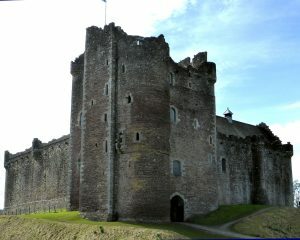 Doune Castle near Stirling has starred in Monthy Python & the Holy Grail and the pilot episode of Games of Thrones. In Starz TV’s adaptation of Diana Gabaldon’s phenomenally successful Outlander novels, Doune plays Castle Leoch. As itself, this mighty mediaeval Scottish castle played host to a daring escape of prisoners in January 1746. One of those men was a future signatory of the American Declaration of Independence. The Reverend John Witherspoon was 23 years old and already a Church of Scotland minister in Beith in Ayrshire. Opposed to the Catholic Bonnie Prince Charlie and his plans to regain the British throne for the Stuarts, Witherspoon raised a militia from his congregation. He rode off at its head, ready to fight on the side of the Government and the House of Hanover. He seems to have fallen into Jacobite hands before he could get the chance. The Battle of Falkirk in January 1746 was a victory for the Jacobites. Although they failed to build on their success, they did take some prisoners before they headed back north to the Highlands. Doune Castle near Stirling must have seemed impregnable, especially for anyone trying to break out of this imposing fortress. Its solid stone walls still soar up to the sky. Witherspoon was a prisoner there with several of the pro-Hanoverian students of Edinburgh’s College Company, including John Home. Home later published The History of the Rebellion in Scotland in 1745, in which he describes how a group of them made up their minds to escape. The plan was a bold and risky one. They were kept high up in the castle, just below the battlements, with a drop of over 70 feet between them and the ground below. In classic style, the young men tied together their blankets to fashion a rope. At about one o’clock in the morning they began to lower themselves down. It was a moonlit night but there was no guard posted at that part of the castle walls. Four made it down safely. The fifth man was taller and heavier and the rope broke under his weight, leaving a shortfall of 20-30 feet. At the cost of a painful fall, a sixth man made it down. The seventh was not so lucky. He survived the fall but died later of his injuries. His name was Neil MacVicar, son of the manse on the island of Islay. John Witherspoon, John Home and the others got away safely. Home too became a minister and also a playwright, known for his play Douglas. Witherspoon crossed the Atlantic, helped found the University of Princeton and became one of the signatories of the Declaration of Independence. Historic Scotland plans to re-enact the plotting by Witherspoon and his friends of the daring escape from Doune Castle in August 2015. Creative Writing Masterclass at Eden Court Theatre, Inverness. Loved reading your book the Bare parsed Banditti. Have to say though your interpretation of Witherspoon escaping from Doune does seem at odds with Home accounts? Hi, just seeing this comment now. Actually, my source for Witherspoon’s escape is Home’s History of the Rebellion in 1745, so I’m not sure what discrepancy you’re seeing.